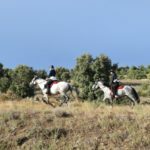 Vest for Madrid vil du på disse turene utforske fjellene i Castile og Leon. 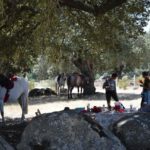 Denne uoppdagede regionen av Spania kan skilte med en varm velkomst, vakre hester, fantastisk utsikt og deilig tapas. Pluss selvfølgelig de flotte Gredosfjellene. 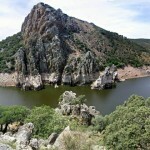 En varm velkomst venter deg i den sørlige regionen av Castile de León, ca. 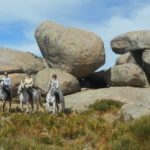 170 kilometer fra Madrid, hvor de kolossale granittsteienne fra Sierra de Gredos fjellene ligger. 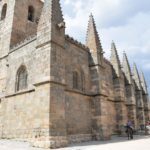 Ávila i Castile de León er basen for disse fantastiske turene. 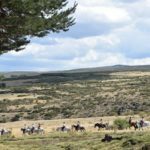 Sjøer, kløfter, klipper, enger, springvann, elver som Tormes med sitt krystallklare vann og gigantiske naturlige steinvegger, er alle med å forme Sierra de Gredos fjellene, hvor det høyeste punktet er Almanzor på 2.592 meter. Alle timene i salen gir deg muligheten til å utforske dette avsidesliggende området mens du finner veien gjennom fjellpassene. 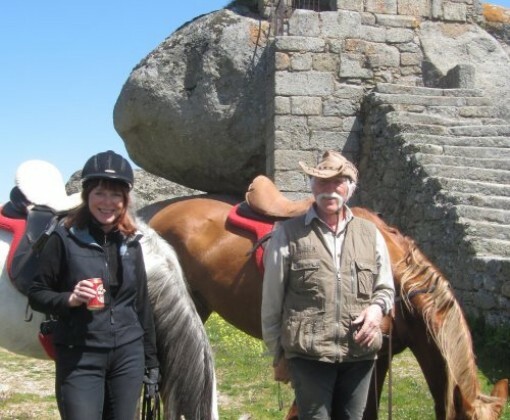 Du rir gjennom variert terreng; fra furu, eik, kastanje og bjørkeskoger i Gredosfjellene, krysser bekker og elver i dalene, klaterer opp i fjellsidene til høyereliggende områder med sin rene luft og fantastiske utsikt. Langs veien rir du forbi avsidesliggende landsbyer med hus og veier bygd av stein, hvor du bare føler fred og ro. 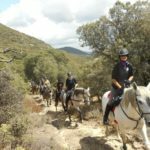 På alle turene er ridning på vei begrenset til et minimum og tempoet er avslappet som gir deg tid til å nyte omgivelsene, men det vil også bli mulighet for noen trav og galoppstrekninger også. De første dagene vil være mest i skritt så du får mulighet til å bli kjent med hesten din. Det er verdt å merke seg at det ikke er noen rask ridetur, og mesteparten av turen vil bli i skritt. Det varierer imidlertid litt på tempoet på hvilken tur du er på. 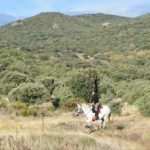 Den største fordelen med klimaet i Gredos, fra en utendørs entusiast sitt synspunkt, er at det generelt er mere solrikt og tørrere enn andre spanske fjellkjeder, slik som Pyreneene, og det betyr at du kan nyte utendørsaktivitetene som ridning i deler av Gredos på nesten alle tider av året. Det er 4 forskjellige turer å velge i mellom, se Program. Alle turene er guidet av den erfarne eieren Emilio Rodriguez. Emilio er en rolig og dyktig rytter og har et spesielt forhold til sine hester som gjør at de er velbalanserte, tillitsfulle og velopdragne og er en fonøyelse å ri og omgås. 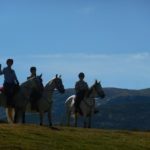 På turene kan du ri mellom 4 – 7 timer hver dag og det er derfor viktig å være i god form. 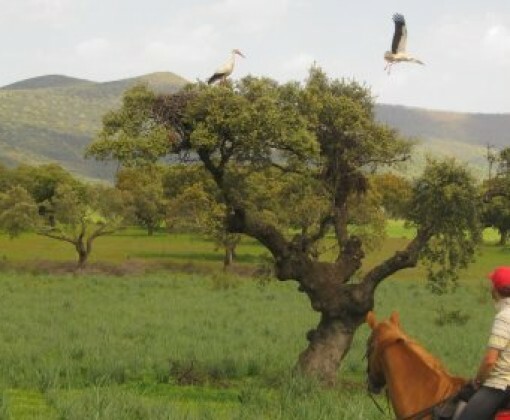 Hestene er en blanding av Hispano-Arabere, Spanske, Andalusiske PRE (Pura Raza Española) og Andaluserkrysninger med ca 152 – 168 cm i mankehøyde. De har et godt temperament og er stø på foten på de steinete stiene i fjellene. De er villige og fremadgående på de flate og sandige strekningene i dalene som gjør dem til en fornøyelse å ri. Emilio avler og kjøper hestene sine for å trene og skolere dem selv. 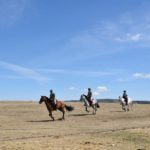 Som et resultat er de fornøyde, elskede og behagelige å ri, med en entusiastisk gange og en lett samlet galopp. De rir med komfortabelt engelske saler og hodelag. Rumpebeskytter (seat savers) og saltasker er også tilgjengelig. Du må kunne beherske skritt, trav og rolig galopp utendørs. Å engasjere seg er av nøkkelelementene på disse turene og du vil være ansvarlig for å fore, strigle og sale på din egen hest hver dag – men det er alltid hjelp å få hvis du skulle trenge det. Maksimum vekt for ryttere er ca 90 kg og normalt er det maksimum 10 personer på en gruppe. Deres collie hund, Brasas, fortjener også å bli nevnt, da hun ofte vil lede veien hvor terrenget tillater det og sikrer at hver deltaker i gruppen blir mødt med hennes logrende hale, som både den første tingen om morningen og det siste om kvelden. Du kan velge mellom 5 turer i dette området. 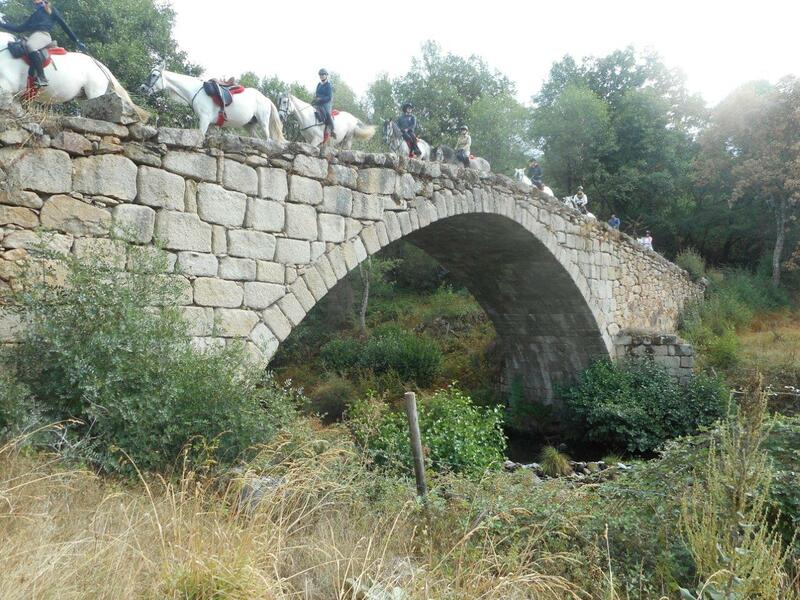 Den raskeste turen er Castles of thge Gredos Mountains. 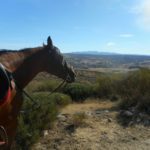 Four Valleys mest rolig; litt galopp siste dagen. 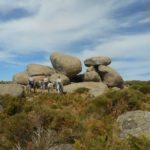 For mindre erfarne ryttere egner Crystalline waters best. Dette er et stasjonært ritt hvor bor på samme sted hele uken. Der kan du for eksempel la være å ri en dag hvis du ikke ønsker eller orker det. 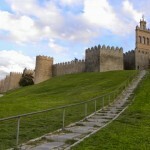 During your transfer from Madrid you will get the chance to look around the old city of Avila. 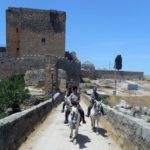 Avila is surrounded by ancient city walls, gateways, watchtowers and turrets and is one of the best-preserved medieval bastions in Spain. 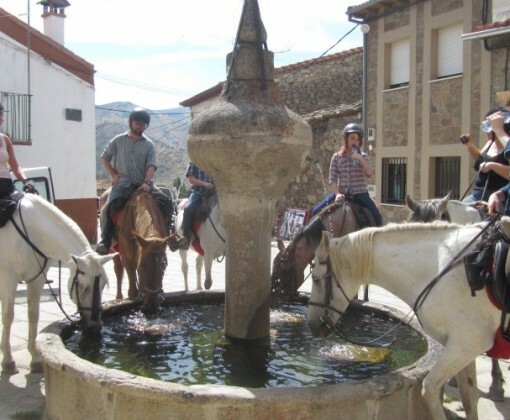 After a refreshing drink you continue onto your accommodation for the night. Over dinner you get to know your guide and chat about the week ahead. The following is the proposed itinerary but please note that changes are possible due to weather and local conditions. 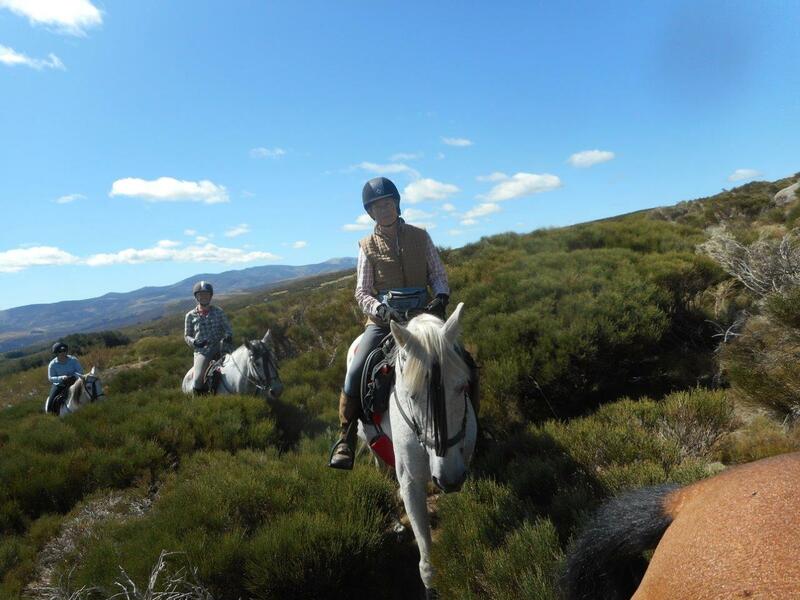 During the warmer months there will be the opportunity to swim in the rivers and streams at most lunch stops (weather permitting), so remember to pack your costume just in case! 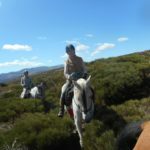 After breakfast there is a short drive to the stables to meet your horses, saddle up and set off for your first morning ride. 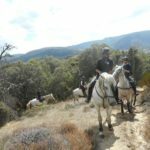 This morning is a quiet ride through the pine forests and the Tornes valley, allowing you the chance to get to know your horse for the week. 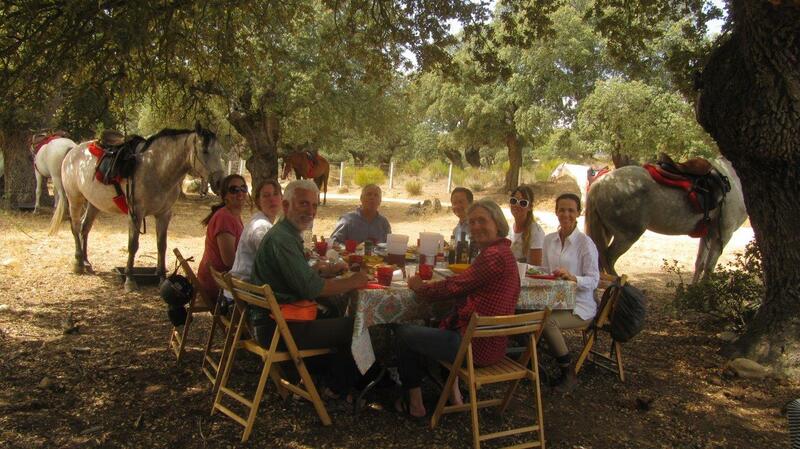 Lunch is at a fisherman’s hut beside the river and you might be lucky enough to sample Mamen’s homemade paella. 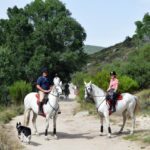 After a post lunch siesta, there is a short afternoon ride along the mountain paths following the path of the river to Navacepeda. 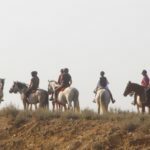 When you arrive at your new overnight accommodation you will help to see to the horses, feeding them and helping to turn them out into their fields/paddock for the night. Later meet for supper at c.9pm. This will be the usual plan each evening when you reach your new accommodation for the night. 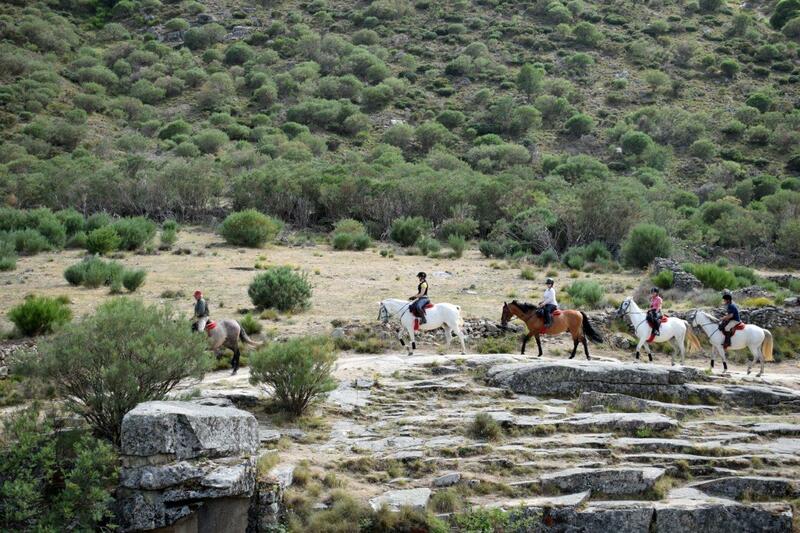 In the morning you help to catch your horse, groom and feed them (this is the same each morning during the trail). 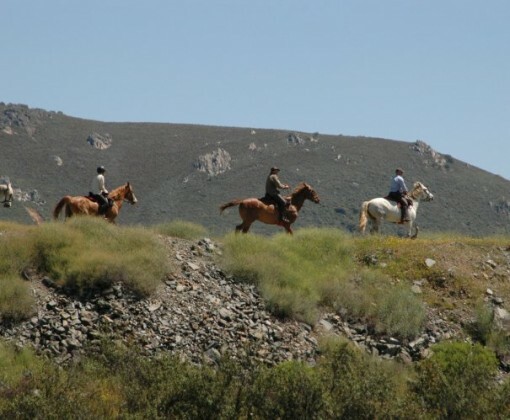 Then it is time to have breakfast before heading back outside to tack your horse up and set off. 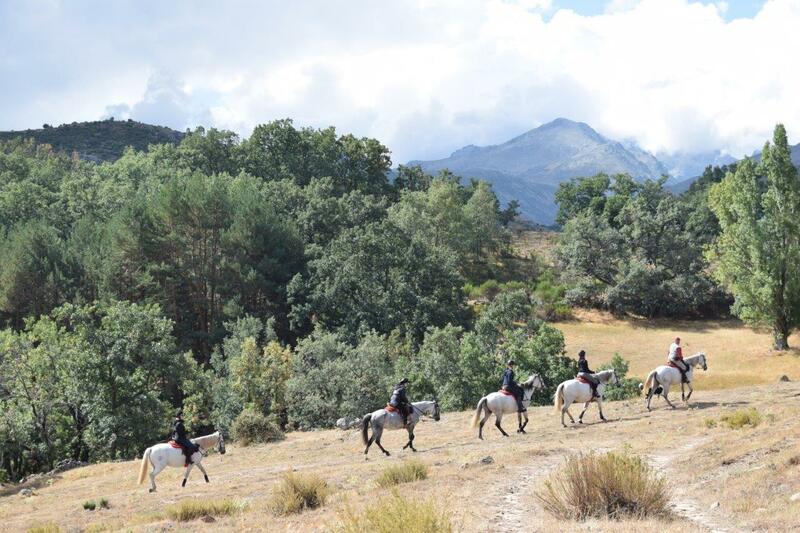 Today is a long day riding and you will have some beautiful views of the Gredos Mountains. 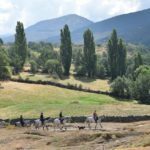 You ride to the top of the valley through small and remote shepherd villages and lunch is near to Aliseda de Tormes beside the river. 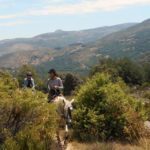 The afternoon ride is back down the valley to Barco de Avila and here you encounter a more open valley and different landscape, navigating your way along the narrow tracks along the hills, through the cover and farmland. 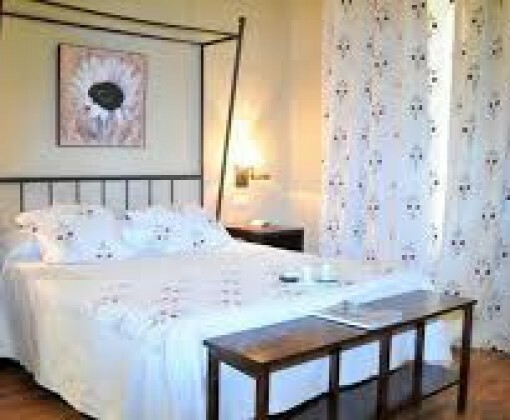 Later you will arrive at your new guesthouse for the night. 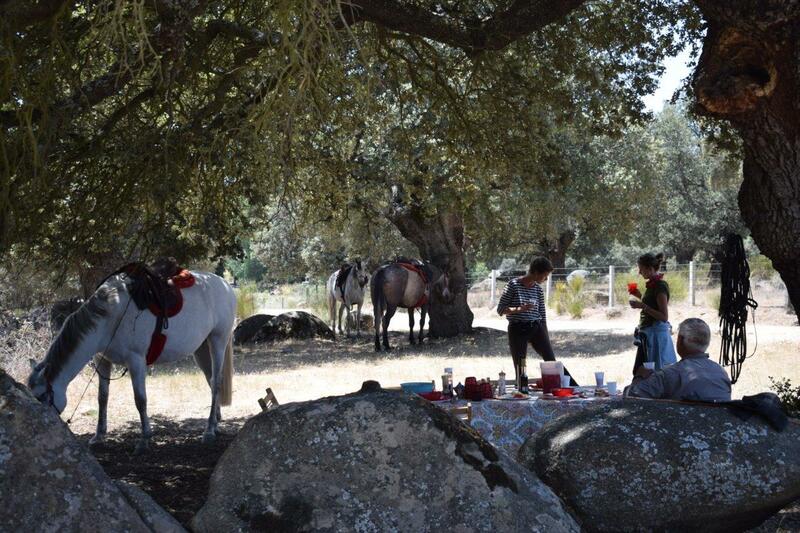 After helping with your horse, have breakfast. 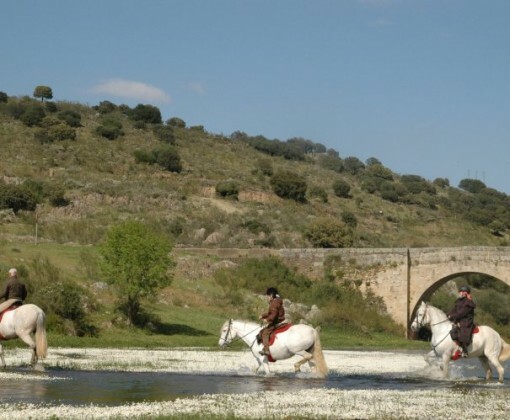 Once riding you will cross the River Tormes by the roman bridge in Barco de Avila and ride into the Salamanca province, a flat and dry area. 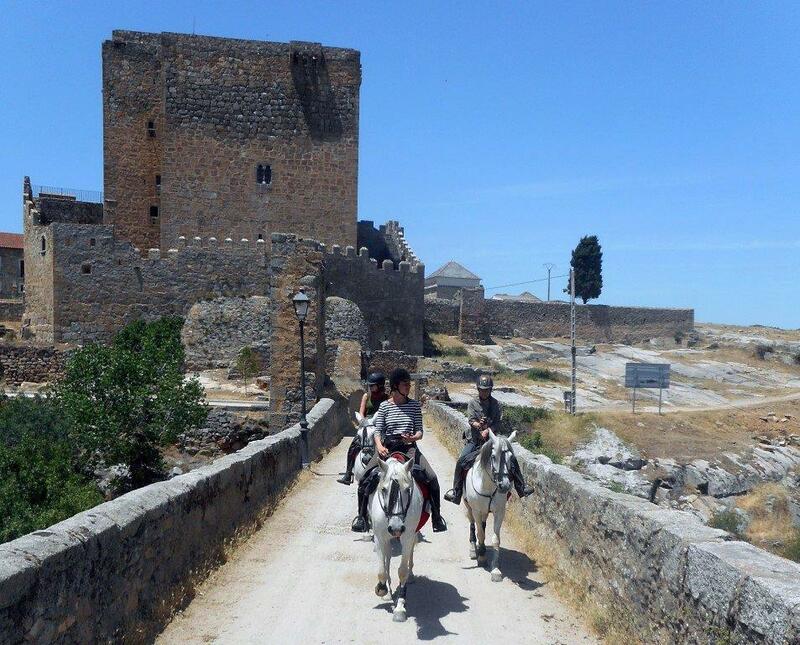 You ride through a very rural region, passing fields with stone walls where we may see farmers riding donkeys. 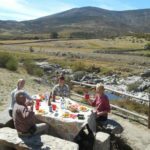 Lunch today is by the river and weather permitting you might get the chance to take a little dip from the river’s small beach. 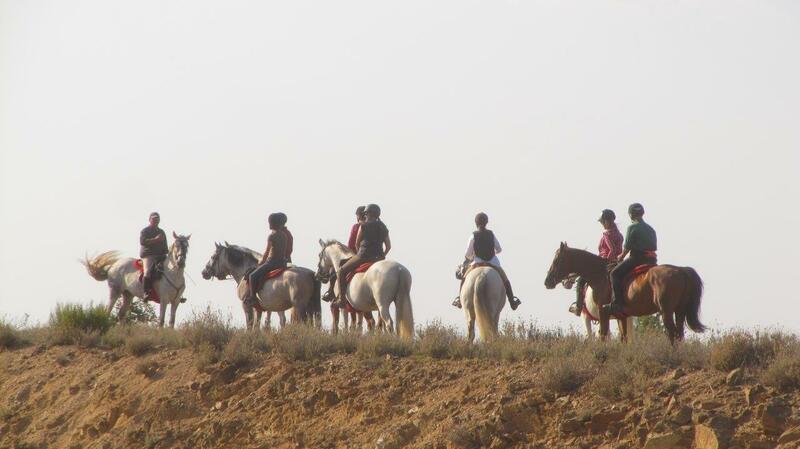 Later enjoy some good canters along the wide tracks before arriving at your new guesthouse for the night. 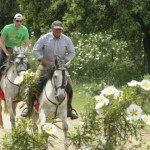 Today you ride on the flatter terrain in the Corneja River Valley before a bar-be-que lunch. 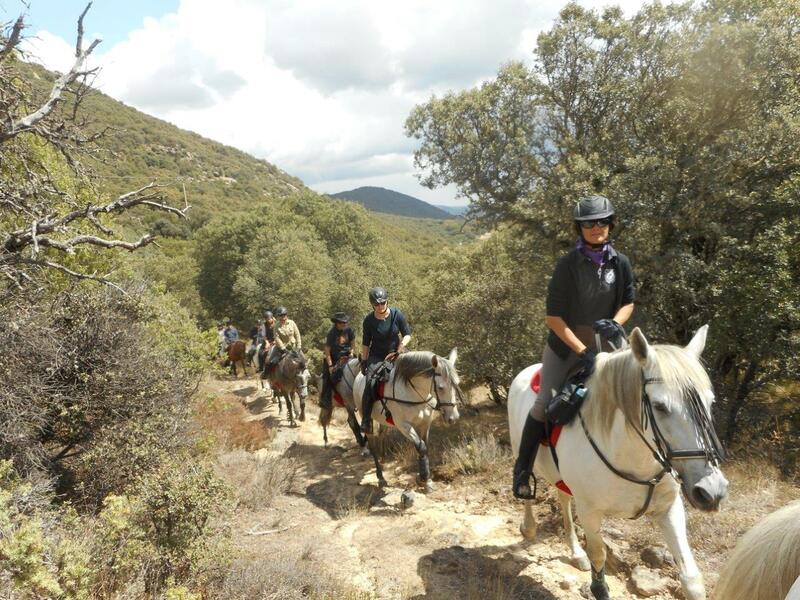 In the afternoon you climb into the mountains and here you will be challenged by steep and rocky terrain. 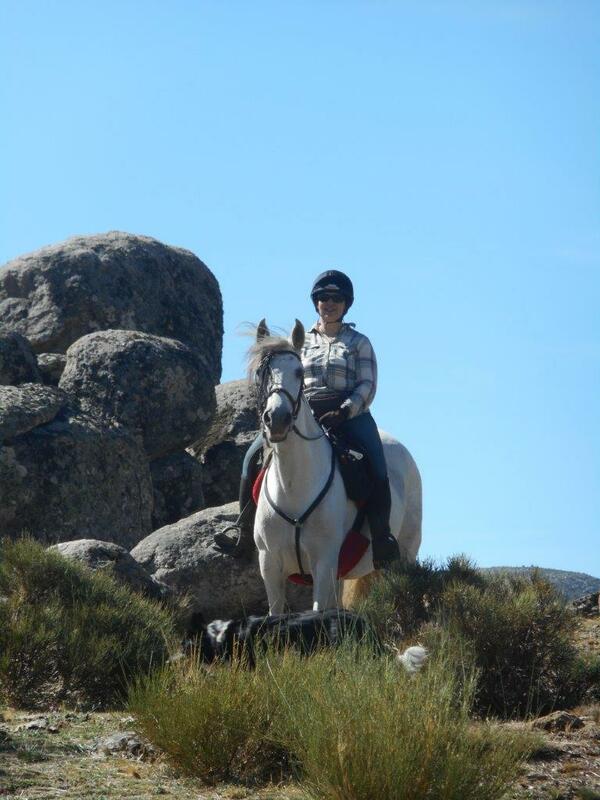 It is amazing how the horses climb and clamber so easily without slipping. 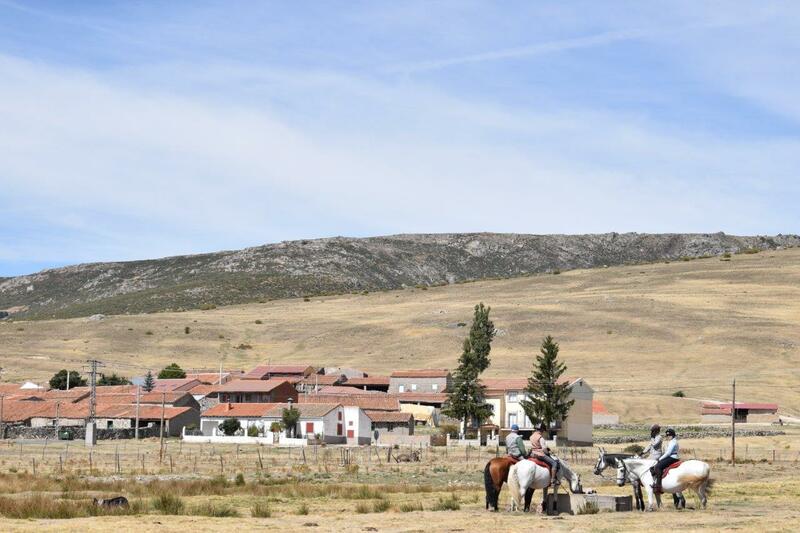 Tonight you will leave your horses in their paddock in the mountains and you will be transferred by vehicle (15 mins) into the old town of Pihedrahíta to your hotel for the evening. 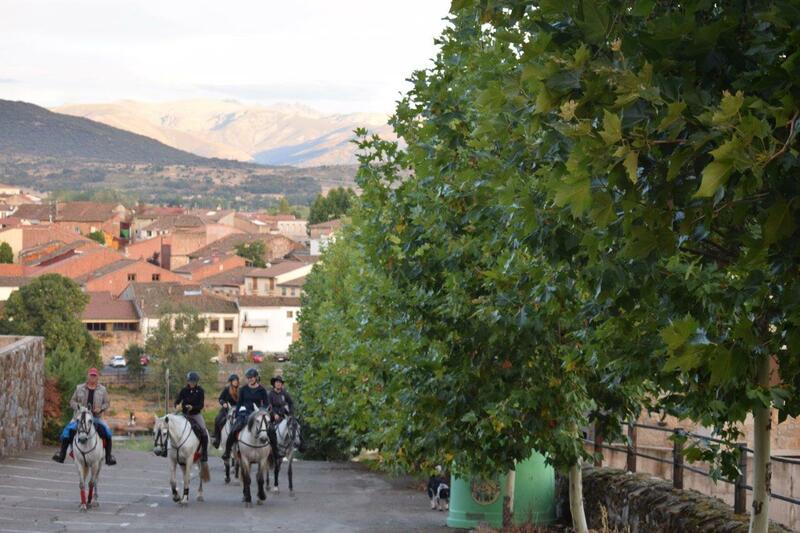 After breakfast you will be driven back into the mountains to the horses. Today is a slower ride. 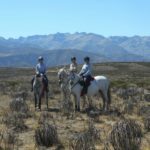 You continue to climb to the highest place of the ride with a magnificent view of the Alberche river valley and San Martin de la Vega. 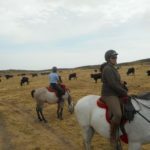 Along the way you clamber across rocky terrain and at times are surrounded by quietly grazing cattle with their cowbells chiming in time to their chewing. 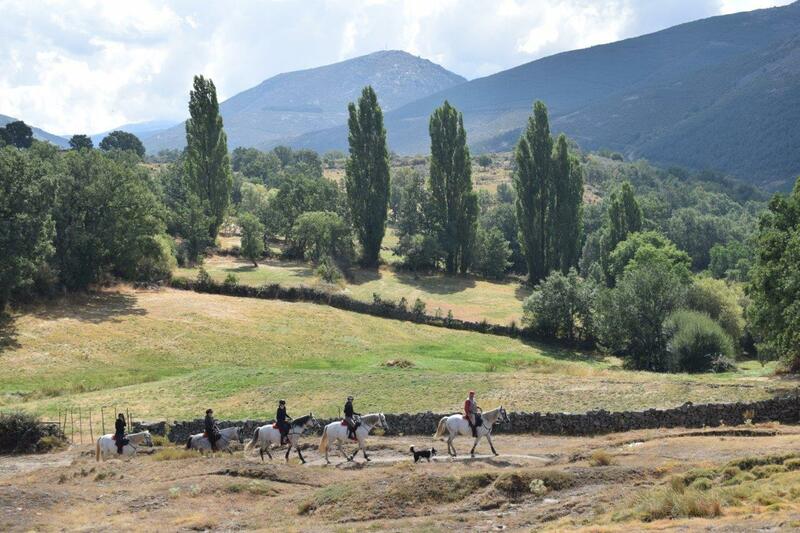 Lunch today is in the shade of woodland with the views of the Gredos Mountains beyond (no swimming opportunities today). 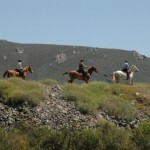 Later you ride down the valley to finish the trail where you began. 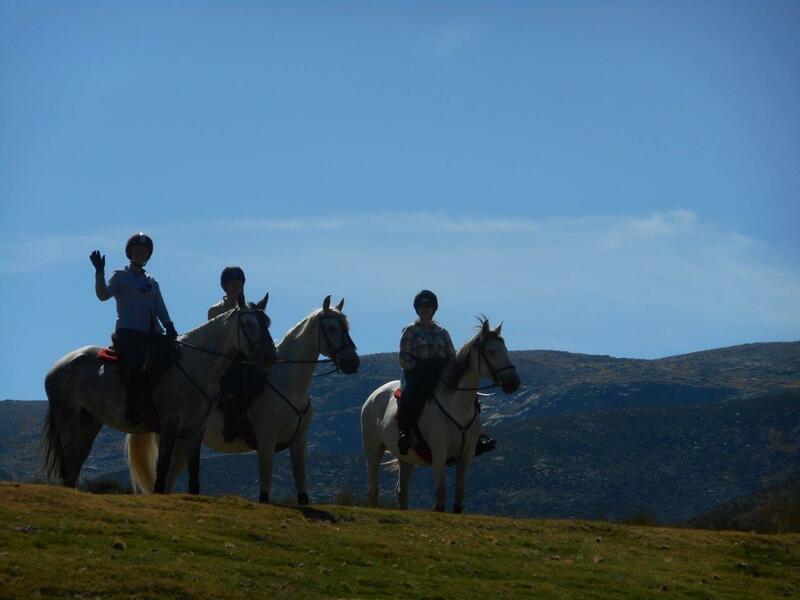 After saying goodbye to your horse at the stables, you will be driven back to your guesthouse for the evening. 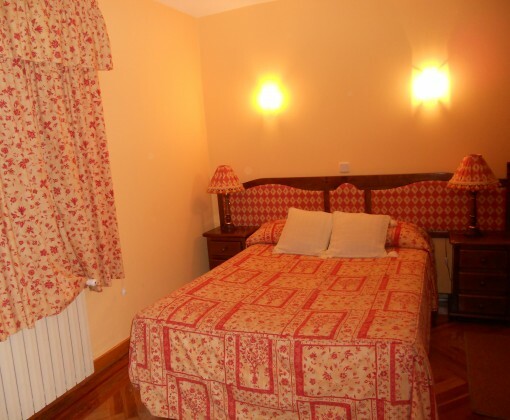 This is usually the same guesthouse as the first night. Later there will be a farewell supper at c. 9pm. 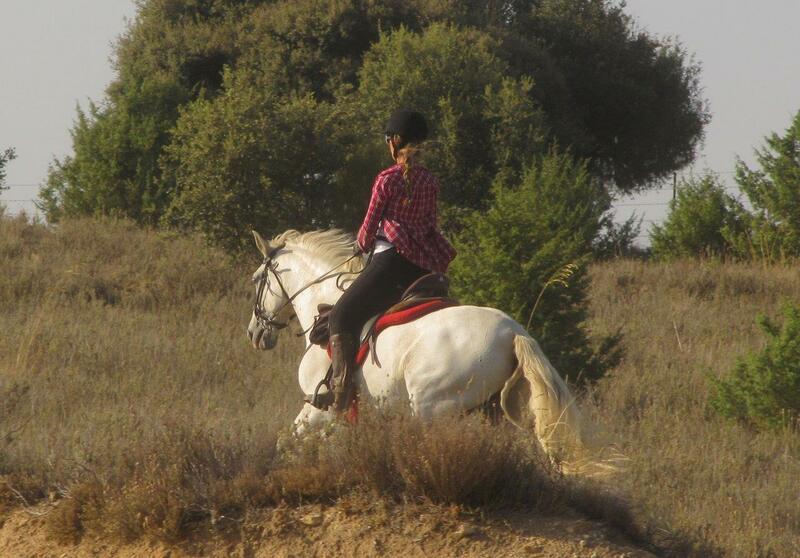 After breakfast transfer back to Madrid. 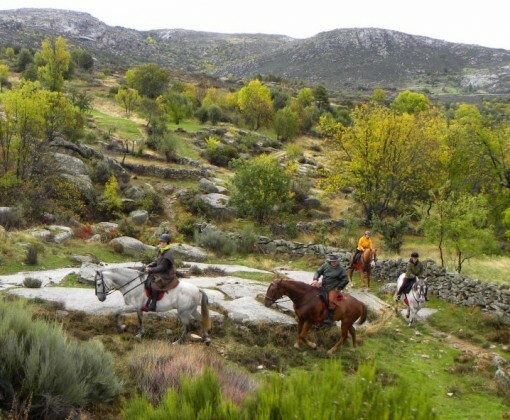 After breakfast you will be driven back into the mountains to the horses. Today is a slower ride. 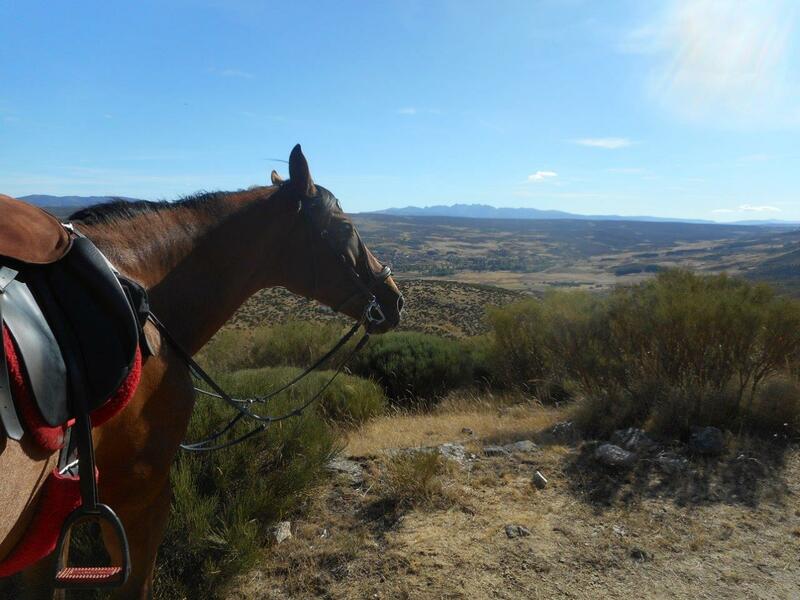 You continue to climb to the highest place of the ride with a magnificent view of the Alberche river valley and San Martin de la Vega. 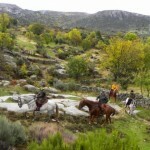 You will be transported by vehicle from the stables back to your hotel in Navarredonda de Gredos. 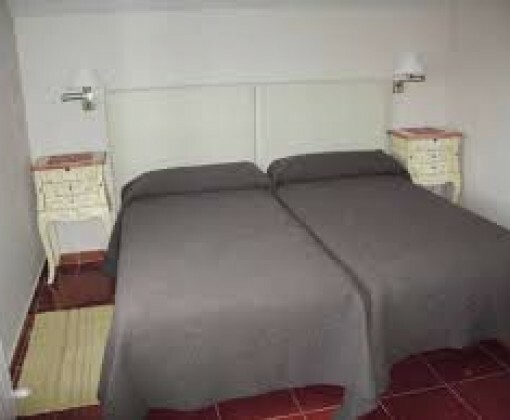 This is usually the same guesthouse as the first night, and you will stay here for the next 2 nights. 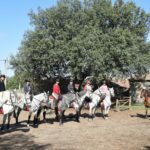 Today you will ride out from the horses stables, enjoying trots and canters through the surrounding woodland forests and along the Tormes River Valley, before returning back to the stables. 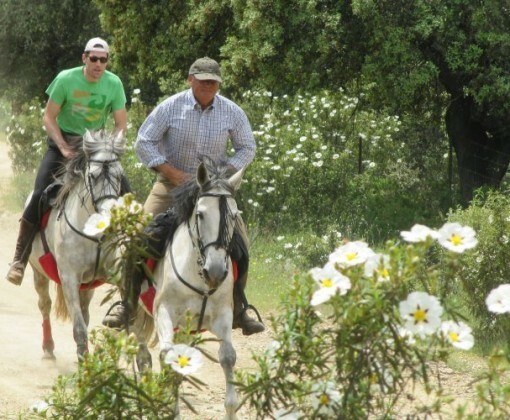 After saying goodbye to your horse , you will be driven back to your guesthouse for the evening. The following is the proposed itinerary but please note that changes are possible due to weather and local conditions. This holiday is perfect for those who don’t wish to move on every single night. 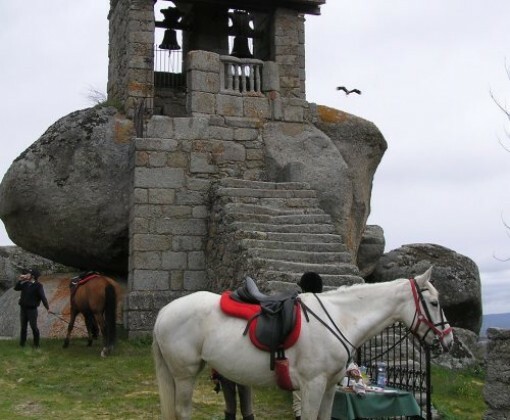 Here you will spend five nights at the same hotel with day rides in different directions every day, exploring the rich landscape of this area. 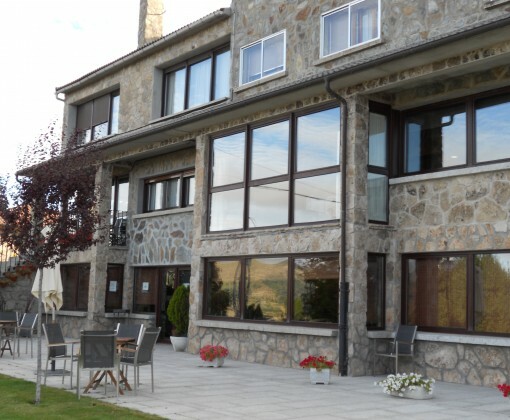 In the middle of the week you will move onto a different hotel in the Tormes River valley for one night. 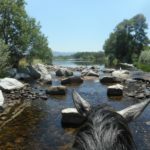 During the warmer months there will be the opportunity to swim in the rivers and streams at some lunch stops (weather permitting), so remember to pack your costume just in case! 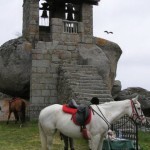 During your transfer from Madrid you will get the opportunity to look around the old city of Avila. 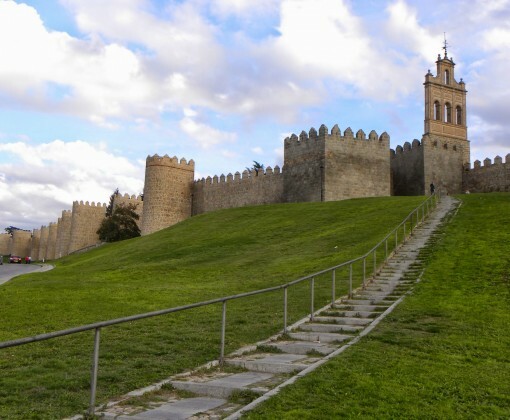 Avila is surrounded by ancient city walls, gateways, watchtowers and turrets and is one of the best-preserved medieval bastions in Spain. 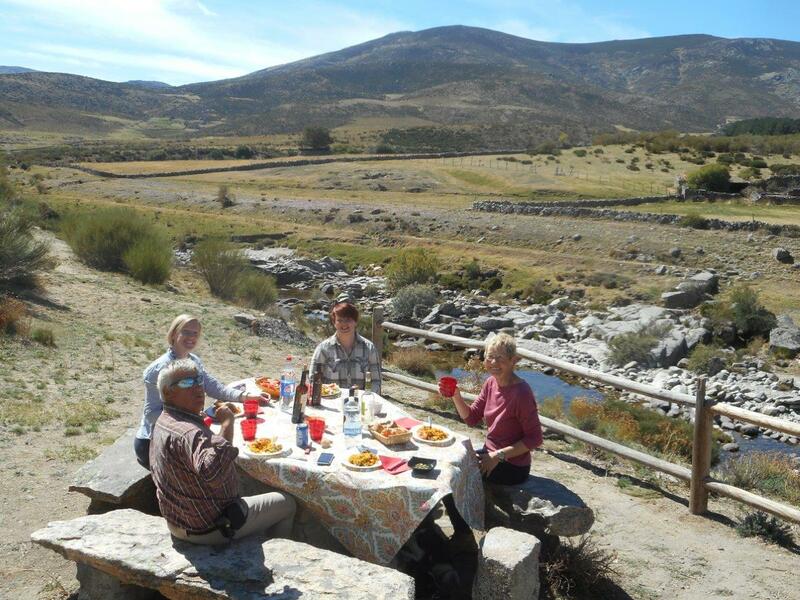 After a refreshing drink you continue on to your accommodation at La Mira de Gredos in Navarredonda. 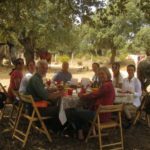 Over a relaxed dinner you get to know your guide and chat about the week ahead. 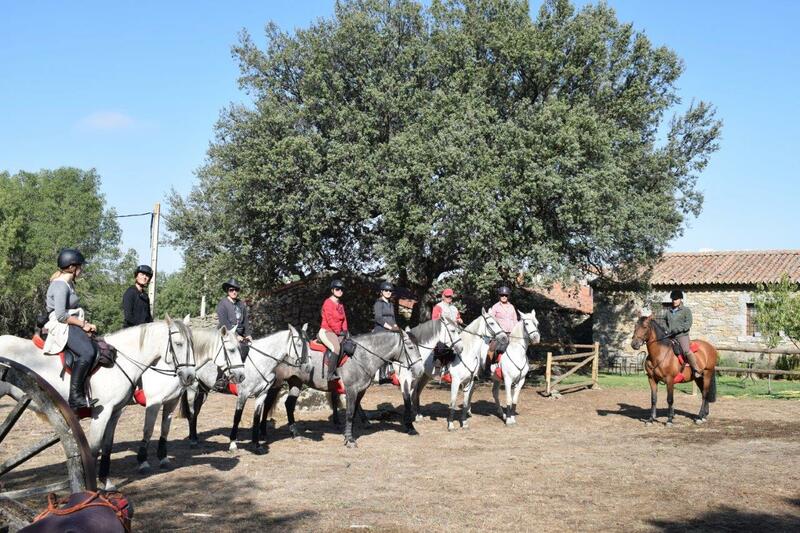 After breakfast there is a short drive to the stables to meet your horses, saddle up and set off for your first days ride. 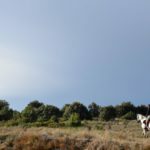 This morning passes through summer pastures in the lower mountains. 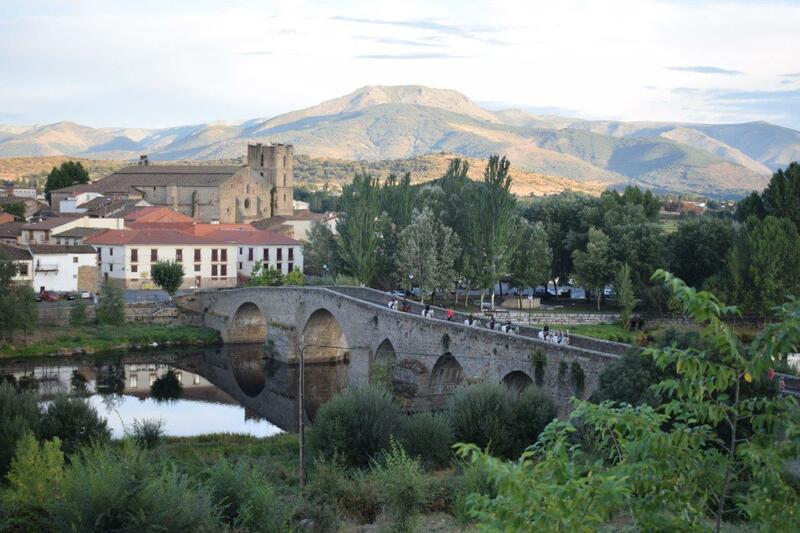 Lunchtime may well be beside the river and you might be lucky enough to sample Mamen’s homemade paella. 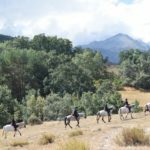 Spend the afternoon riding through the pine forests and enjoy some trots and canters along the way.Overnight in La Mira de Gredos. 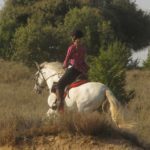 In the morning you will ride along the cordel (this is a path that connects the glens) to Puerto del Pico and as you ride through the pine forest you will be rewarded with beautiful views of the Tietar River valley and Toledo and Caceres provinces. Lunch today is at a local restaurant. 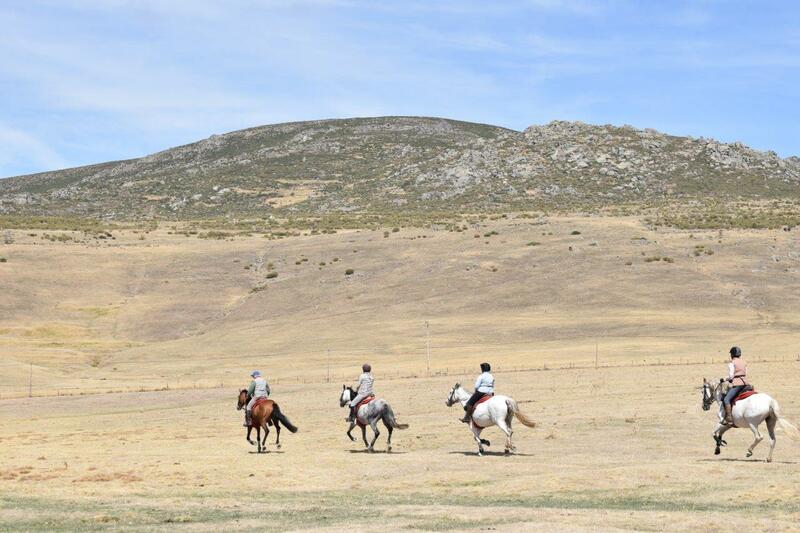 This afternoon enjoy some good canters and trots through San Martin del Pimpollar before returning to your hotel for dinner. 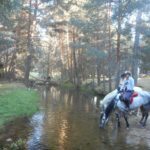 Today, after breakfast you will head in the direction of the highest mountains and at lunchtime you will take your break beside the Barbellido River. 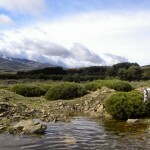 Maybe if the weather permits you might wish to take a refreshing swim in its crystaline waters? 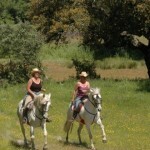 Later take advantage of the Tormes River valley for some fun canters. 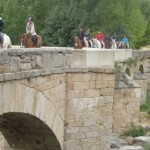 Today you will head off towards another town in the Tormes River Valley where you will spend the night. 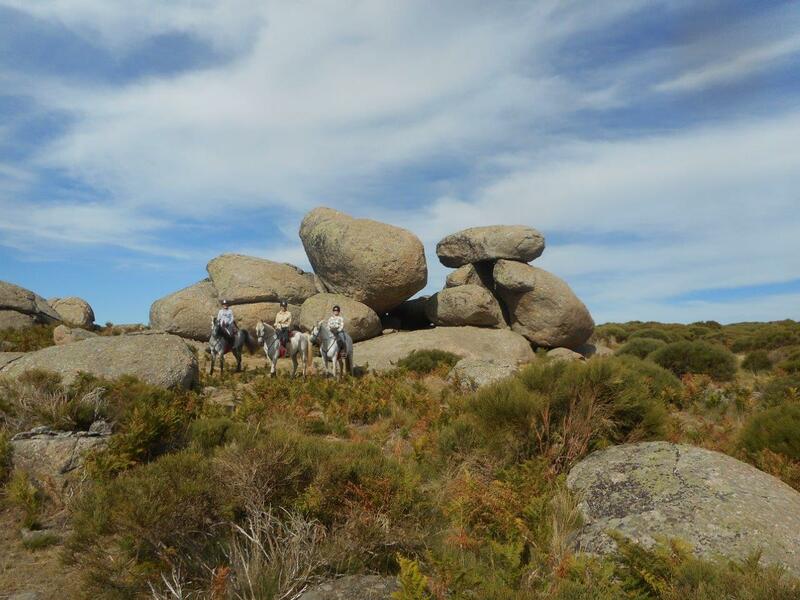 It is possible to leave your luggage at La Mira de Gredos, so we suggest taking a smaller bag with you, with a few overnight essentials, which will be transferred to tonight’s accommodation. 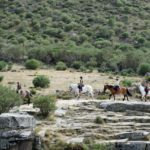 Your route to Navalperal de Tormes begins with you following the river to Navacepeda, an historic town in the mountains, before moving onto Charco de las Paredes where you stop for a relaxed lunch and possibly cool off with a swim too. 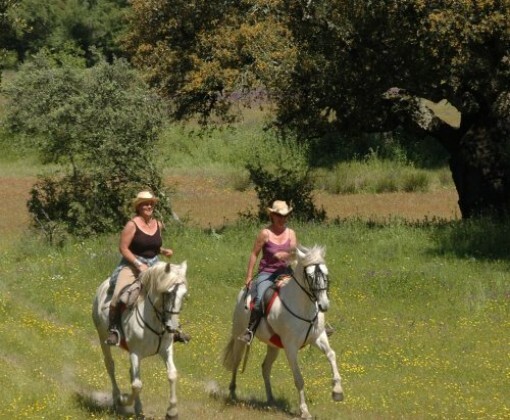 This afternoon you head downhill to the town of Navalperal de Tormes, which is by the river. 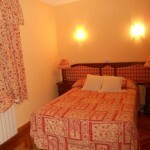 Dinner and overnight at your hotel in Navalperal La Cruz del Gallo. 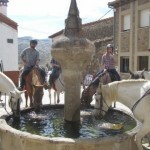 After breakfast, begin heading back to Navarredonda. 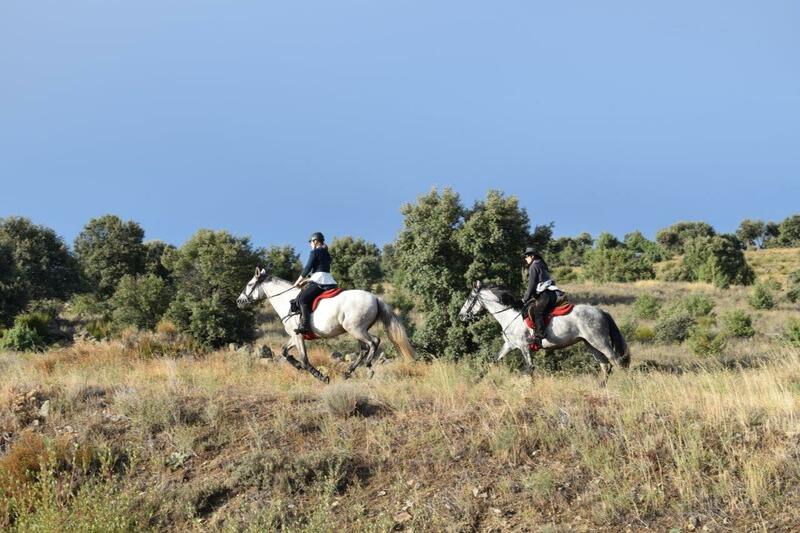 You will enjoy a faster pace this morning, with plenty of long canters along the Tormes River valley. 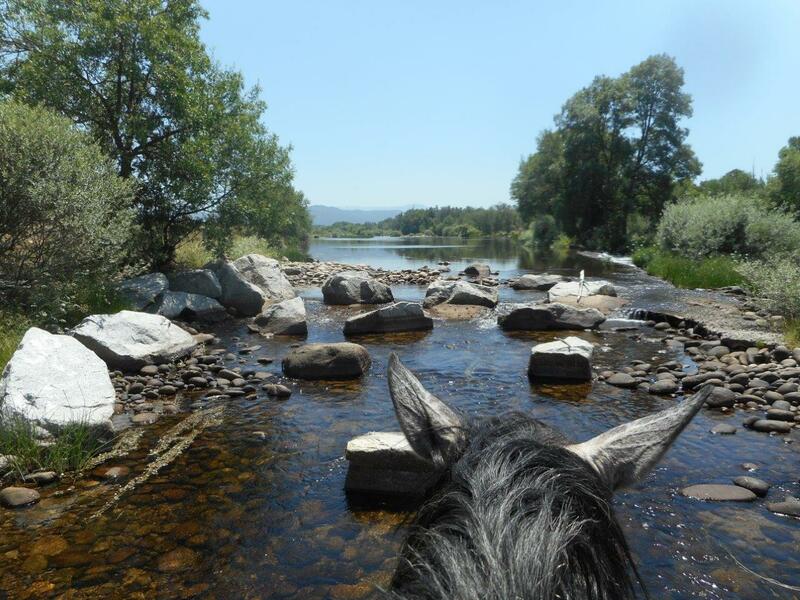 Once you stop for lunch you can cool off with a refreshing swim in the river. 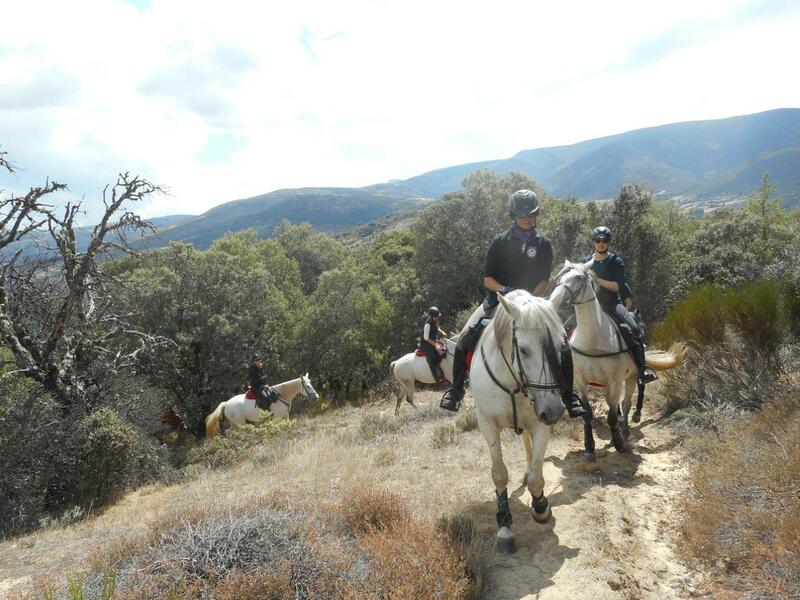 Later enjoy some last canters once again through the pine forest. 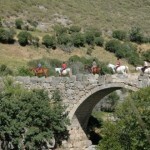 Overnight at La Mira de Gredos. 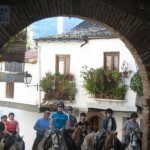 After breakfast transfer back to Madrid in time for your flight. 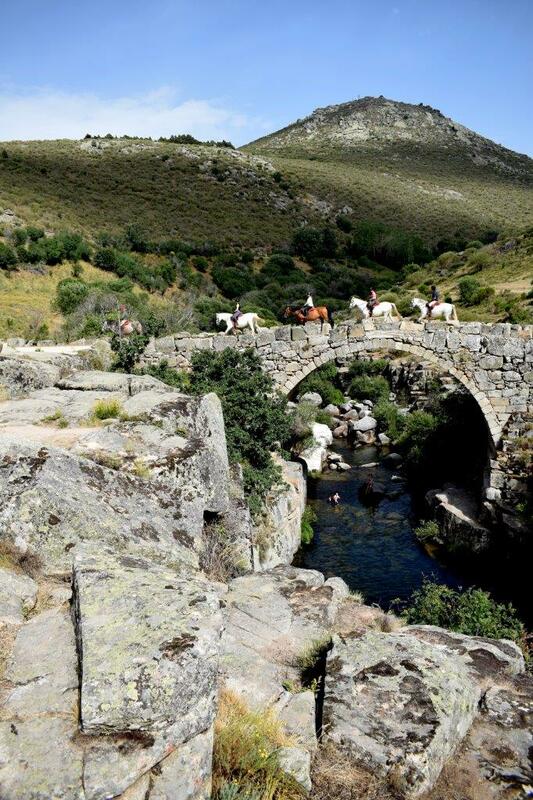 In the Gredos mountains you can ride through four different valleys; Tietar, Alberche, Corneja and Tormes and these beautiful gorges are full of pure crystalline water from the melted snow from the mountains above. 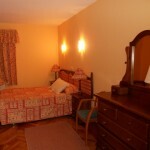 Once you have settled into your room it is time for dinner. Over dinner you get to know your guide and chat about the week ahead. 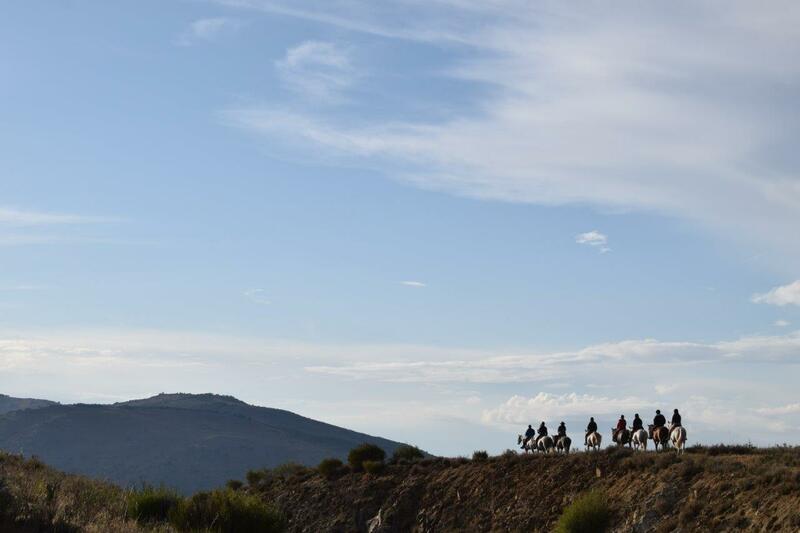 You should be an intermediate rider fit enough for between 4 to 7 hours in the saddle each day. 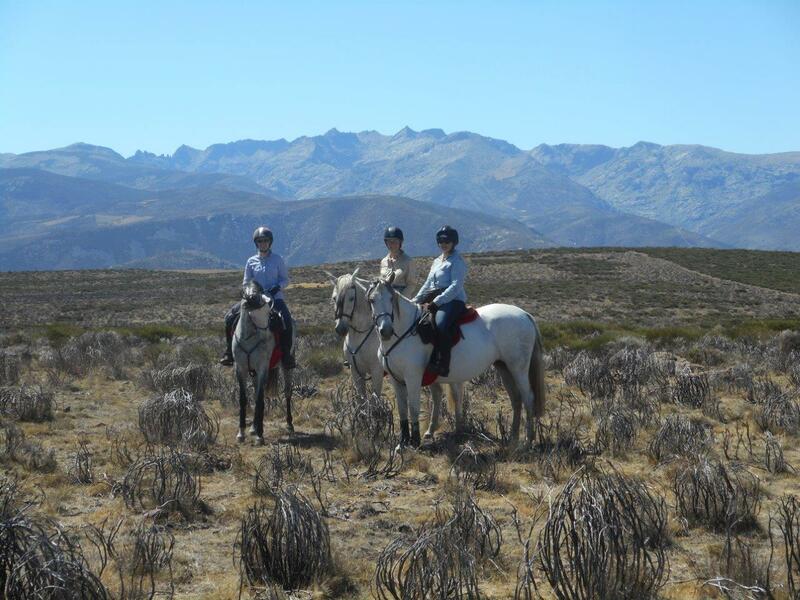 After breakfast there is a short drive to the stables to meet your horses, saddle up and set off for your first mornings ride. 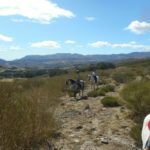 This mornings ride is though the cordel path to join the cañadas until you reach San Martín del Pimpollar, along the way you will see some very beautiful views of the Tormes river Valley. 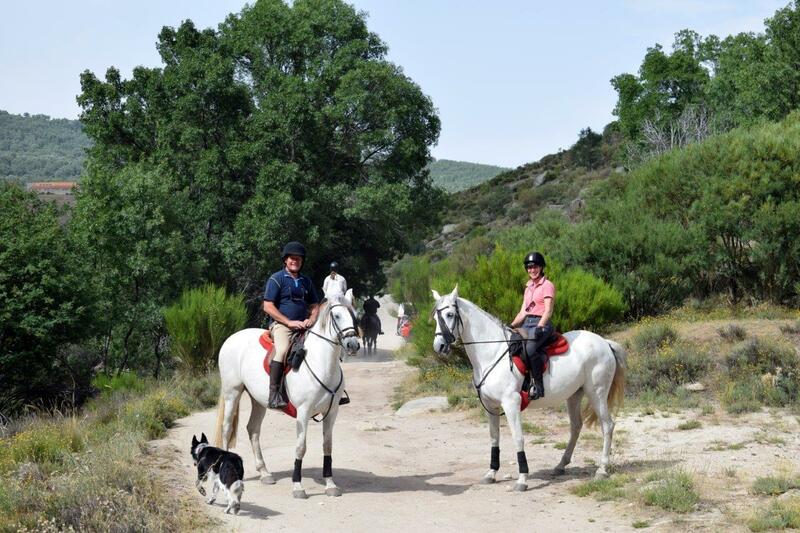 You will stop for a picnic lunch along the way, followed by a Spanish siesta. 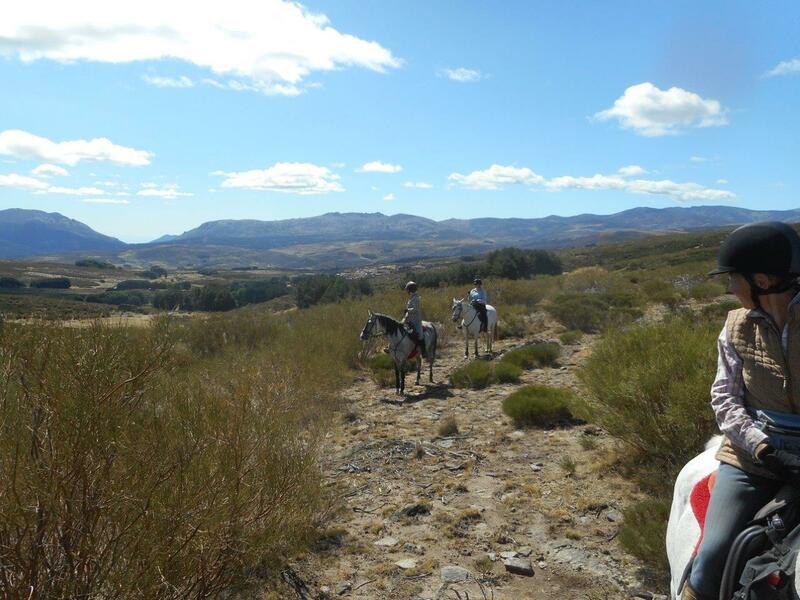 Later you will ride down the mountains to San Martín del Pimpollar. 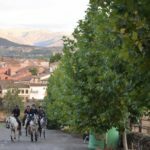 This morning you will ride along the Valley of 5 Villas through gardens of fruits, cherry trees, fig trees, olive trees, grapes. 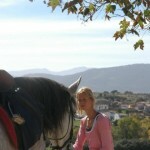 At the top of the valley, Puerto de Serranillos, you stop for lunch. 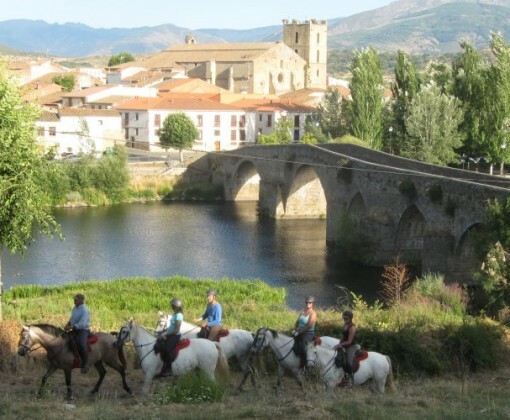 In the afternoon you carry on to the other side of the mountains to the Alberche river valley, finally reaching Burgohondo, a town on the river Alberche. 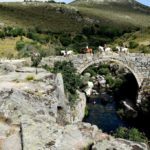 Today you will be following the Alberche river valley, along the way passing through old towns, with their traditional stony houses and very different landscapes (on the north side of the mountains). 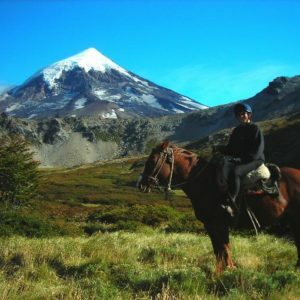 In the afternoon after lunch you reach some of the highest villages in the mountains and you will stay in San Martin del Pimpollar for the night. 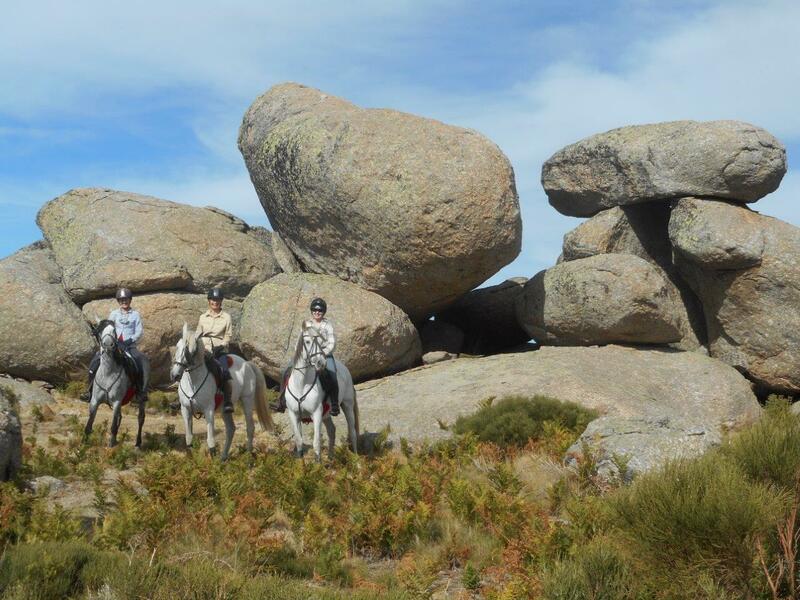 Today you are still high in the mountains with its pine trees, broom, stoney walls. 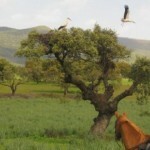 It is in this area that is the summer pastures for your horses. 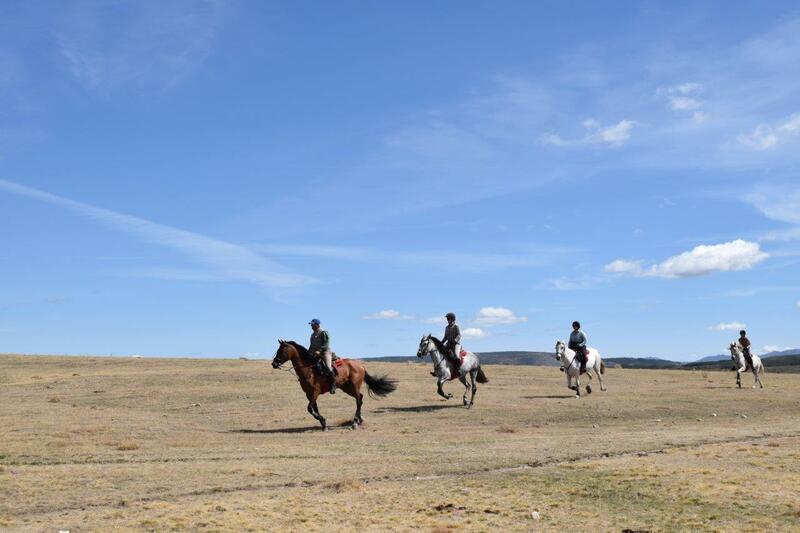 During this ride you will get very close to the source of the river Alberche . 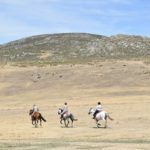 After lunch the afternoon ride is towards Navacepeda, through open landscapes with a beautiful views of the Gredos mountains. 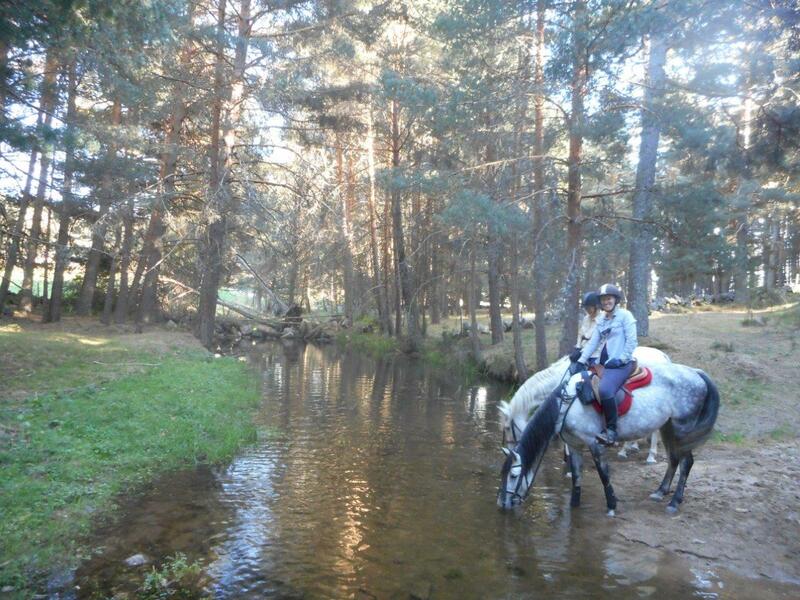 Today is shorter, easier and beautiful days riding following the Tormes river valley. 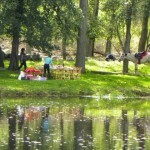 Lunch is beside the river, an excellent spot for swimming in the clean and cold water. 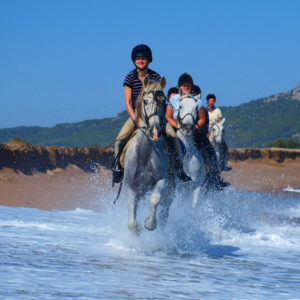 This afternoon you should enjoy some good canters along the way home. 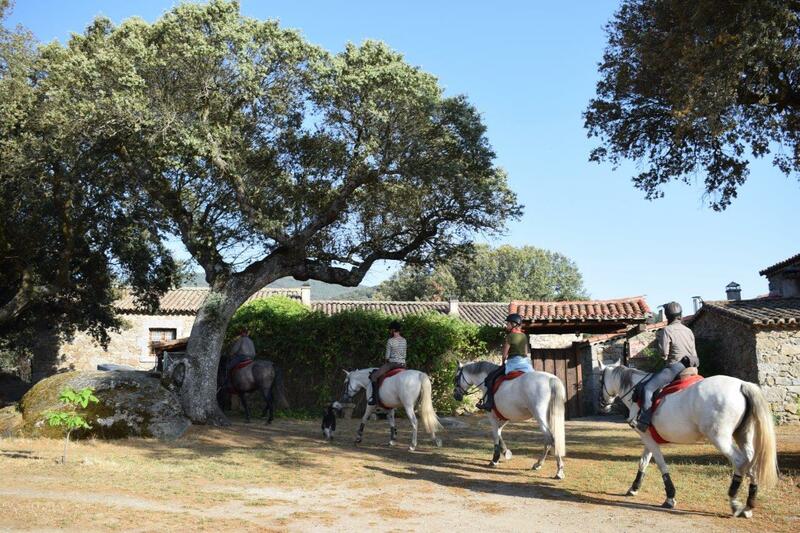 After breakfast you will be taken to the stable yard where you will get to meet your mount for the week. 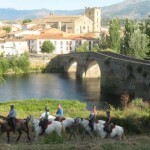 This morning’s ride will be following the Tormes River at the bottom of the valley to the Charco de las Paredes. 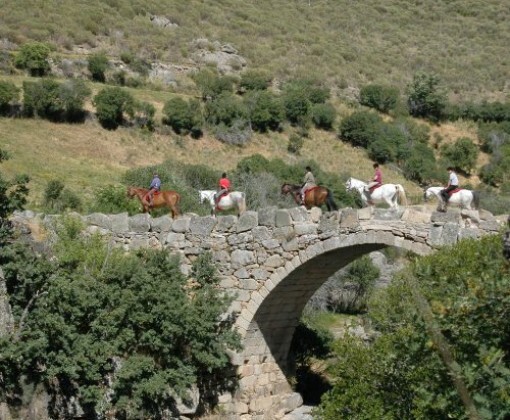 This afternoon your ride is shorter and downhill towards the town of Navalperal. 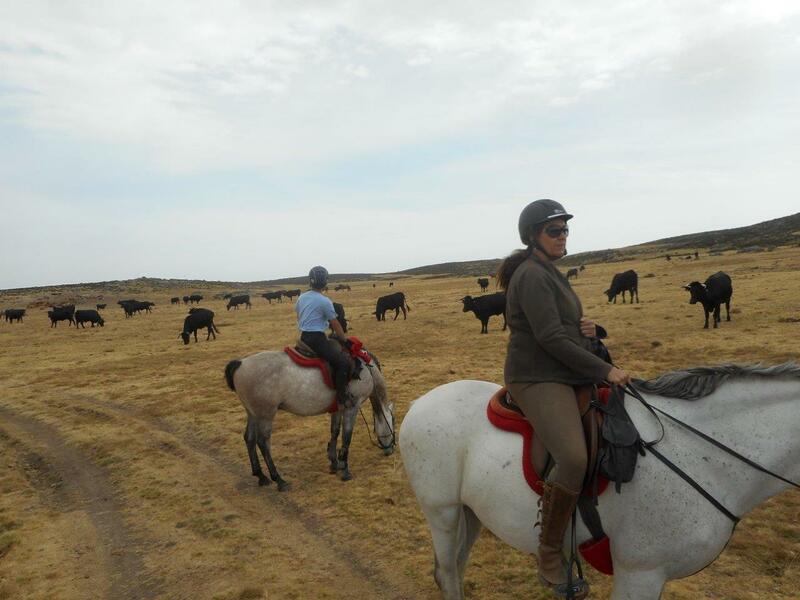 In the morning you will ride along the cattle trail to Barco de Avila and then stop for lunch by the Tormes River. 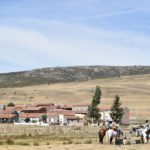 Later after your siesta, you will ride onto Sierra de Bejar and then to Becedas, the last village in Avila province where the horses spend the night. 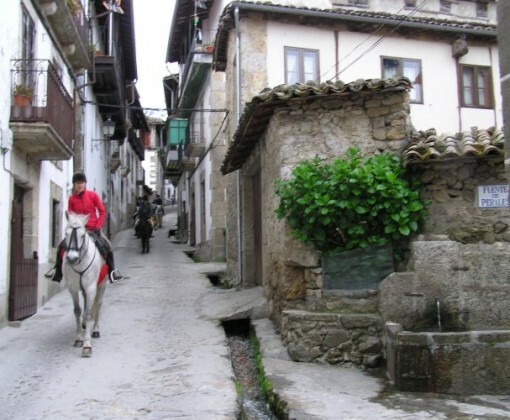 After seeing to the horses you will be taken by the transfer vehicle to the beautiful towns of Candelario, where you will spend the night. 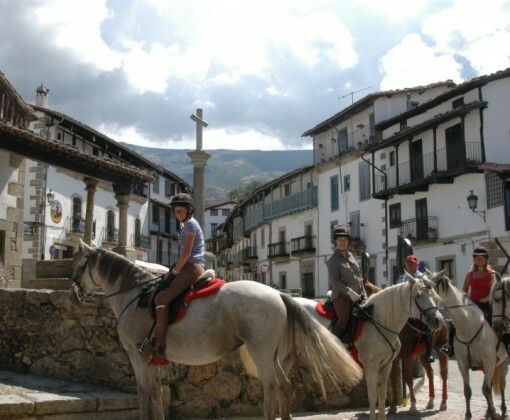 Today you will ride just in the morning between Becedas to Candelario, passing through numerous and intersesting local villages. 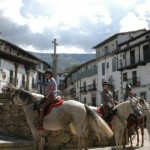 You have a free afternoon to visit Candelario. 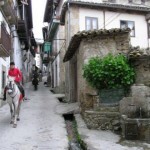 You might like to visit the church, or wander around the towns steep streets spotting the channels that collect the water from the mountains. You will spend a second night at the same inn as yesterday. 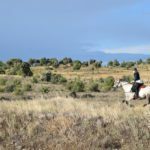 Today you will ride northwards towards Salamanca through Puerto de la Hoya and Neila de San Miguel, stopping for lunch at the church on the way. 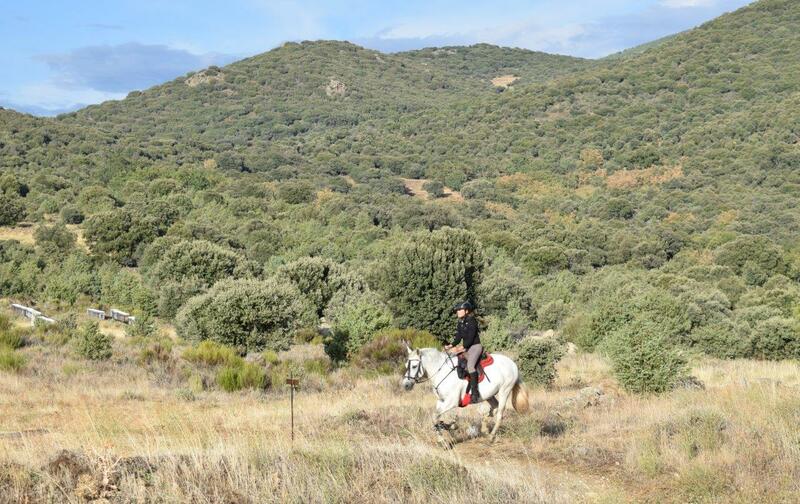 Later this afternoon the landscape you ride along becomes open and flat and eventually you reach the Cañada Soriana Occidental, one of the main pathways in Spain. 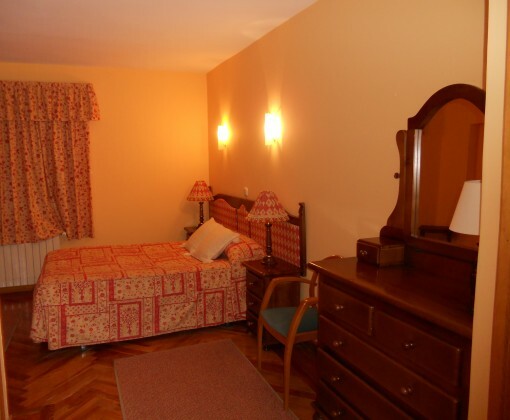 Tonight you spend the night at Guijo de Avila with nice views of the Tormes River. 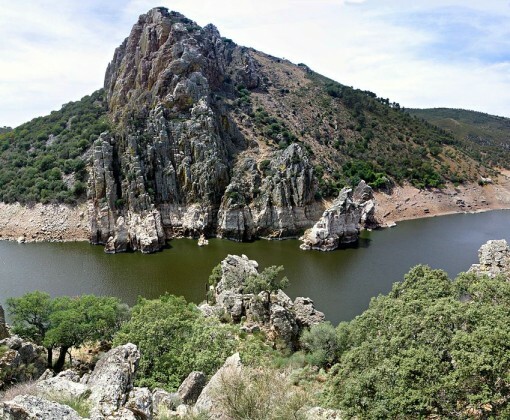 This morning you cross the river Tormes by Santa Teresa´s dam, a huge water reservoir. 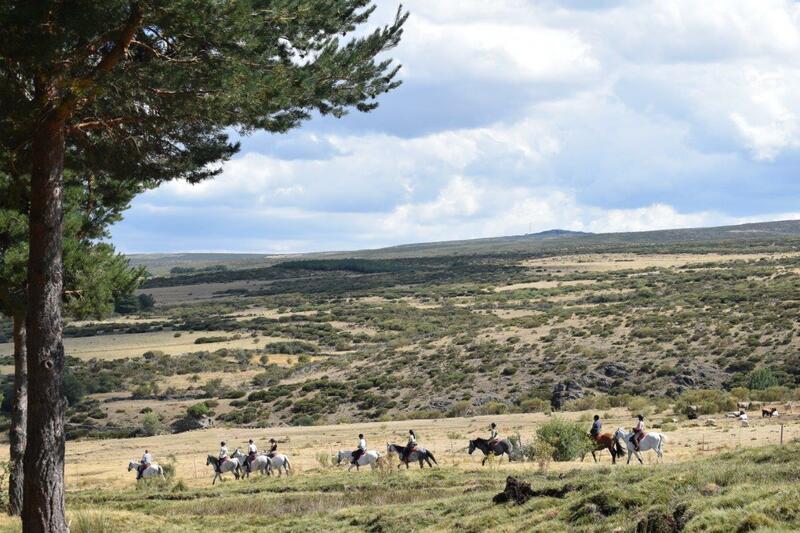 Most of today you will ride through the Dehesas of Salamanca passing it’s holm oaks, bulls,and black Iberian pigs. 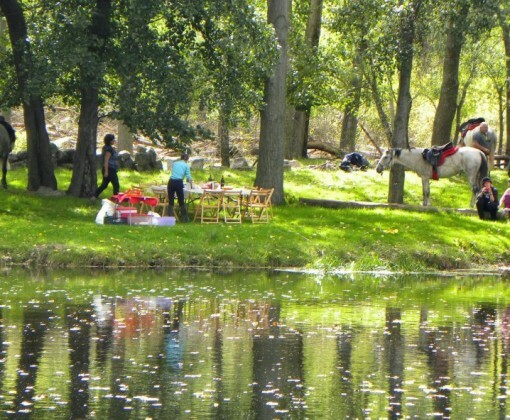 Later you will have a picnic lunch by small river. 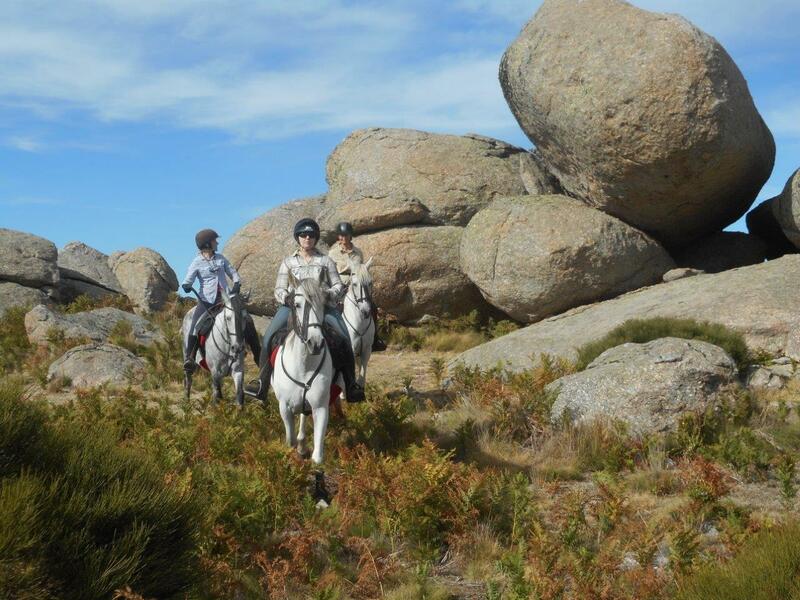 This afternoon enjoy some canters on the way to Horcajo Medianero. 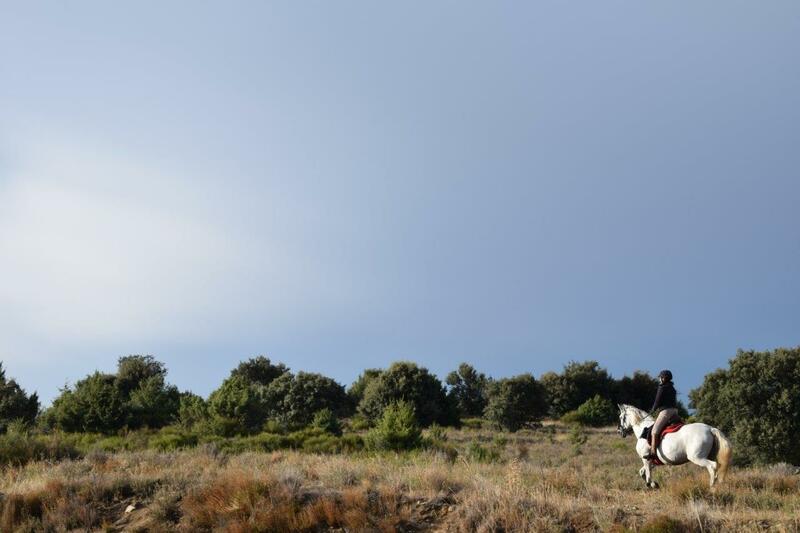 The day begins with a long mornings ride along the Easter lands of the province with beautiful and clear horizons bathed by the waters of the Tormes River. 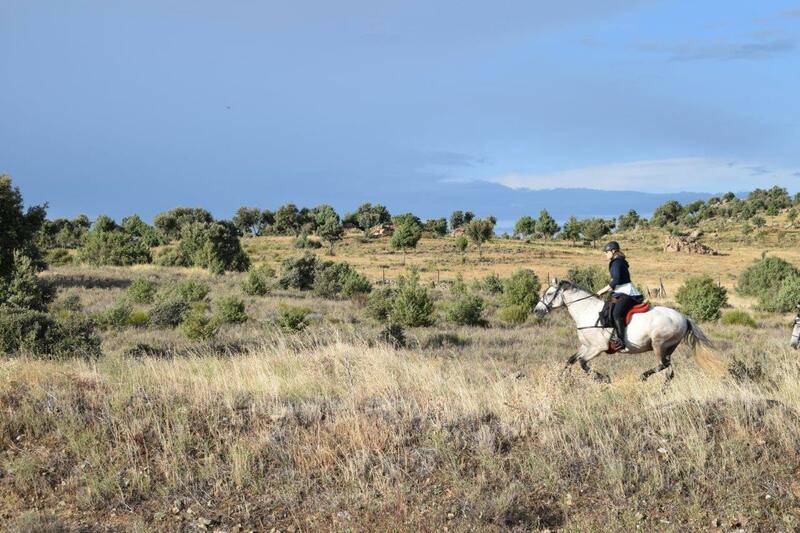 The horses spend the night in Alba de Tormes and travel back home by truck the next morning. 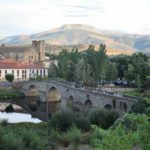 Alba de Tormes, upstream from the city of Salamanca has a strong history linked to Santa Teresa´s life and death, and her body rests in one of the convents here. 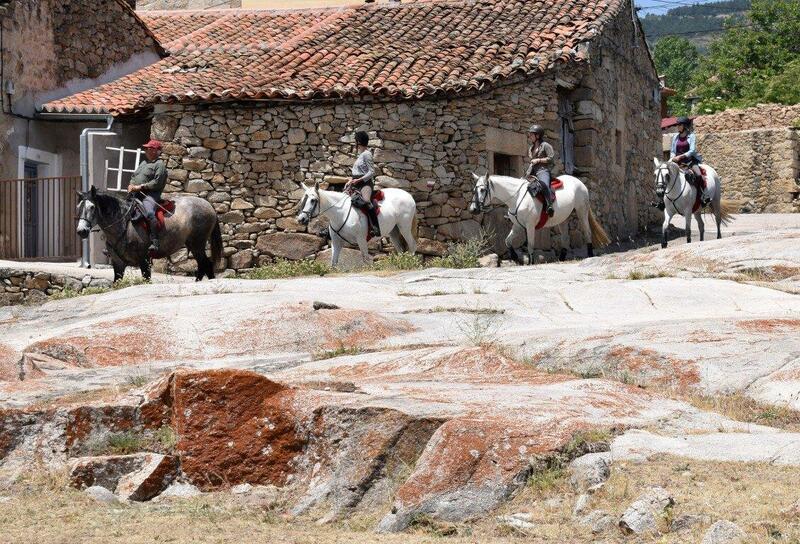 You will be transferred by vehicle to Salamanca (c. 20 minute journey). 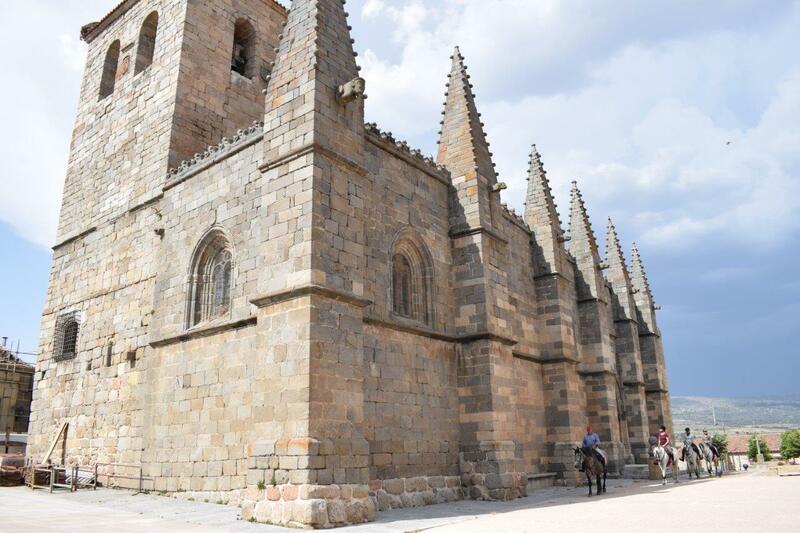 Salamanca is a UNESCO heritage town of astoundingly architecture. 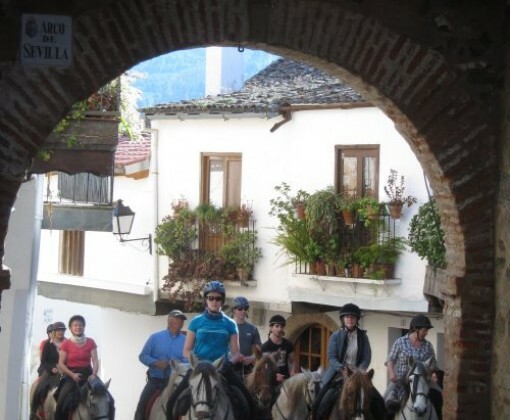 In the late afternoon you can walk along the streets of this historical town, and supper tonight is at a restaurant located at the Plaza Mayor (one of the most beautiful main squares in Spain). 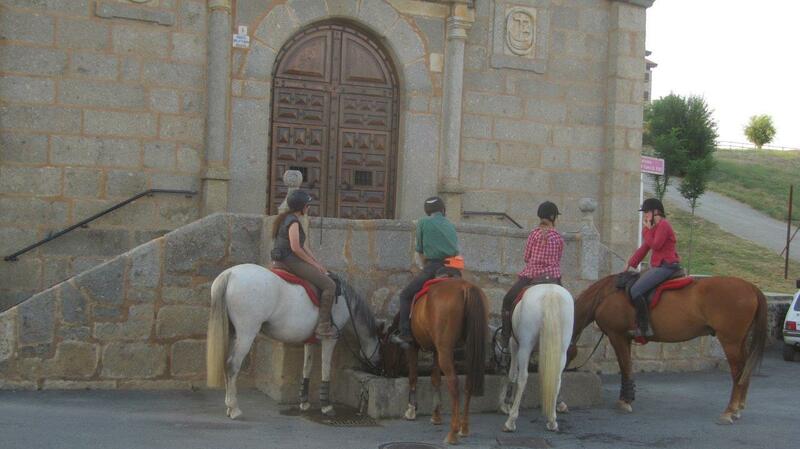 After breakfast there is time to visit Salamanca again and see her important monuments. 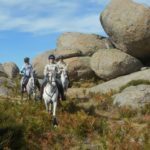 Innkvarteringen underveis varierer fra enkle, rene og komfortable hostel, pensjonater og gjestehus i fjellene til skjønne hoteller i landsbyene. 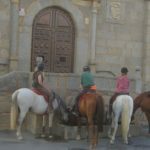 Alle rommene har eget bad, utenom på en natt på Gredos til Salamanca turen hvor du bor litt spesielt i ett kapell, hvor det kan hende du må dele bad. Enkeltrom er mulig på forespørsel og det tilkommet et enkeltromstillegg. 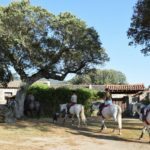 Maten her i Spania er et høydepunkt på disse turene og Emilios kone Mamen vil glede deg med tapas pauser bestående av oliven, nøtter, Iberisk skinke og ost fra La Mancha. Lunsjtid er rolig og sosial med enkle, hjemmelagde spanske retter som paella og tortilla (potetomelett) etterfulgt av siesta i solskinnet eller i skyggen. Som på den spanske måten spiser du seint hver kveld, ca kl 21, og du får et utvalg av forskjellige retter av lokale spanske oppskrifter som spises på gjestehuset hvor du overnatter. Priser 2018: kan variere med valutakurs. Prisen er fastlagt når en tur er bestilt (med unntak ved store valutaendringer). Det gis ca NOK 1 000,- i avslag på turene «Slott i Gredosfjellene» 7 netter på følgende datoer: 18 juli; 22-29 juli og 19-26 august. 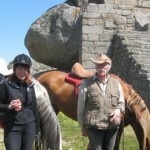 I tillegg gis det ca NOK 500,- i avslag på turene «Slott i Gredosfjellene» 6 netter på følgende datoer: 10-16 juni; 24-30 juni; 9-15 september; 7-13 oktober og 21-27 oktober. ENKELTROMSTILLEGG: Betales hvis bor i enerom men refunderes hvis du er villig til å dele rom og vi finner en du kan dele med. Enkeltrom er avhengig av tilgjengelighet og kan ikke garanteres. UNG RYTTER RABATT: På Gredos krystallklare vann er rabatten 1 500,- for ryttere mellom 10 og 17 år. TRANSPORT: Delt transport på bestemte tidspunkt er inkludert fra flyplassen i Madrid(ved minimum 4 gjester). 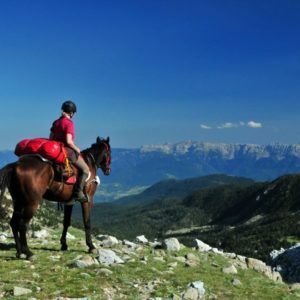 Ellers kommer tillegg på: Euro 25 per person hver vei hvis 3 gjester; Euro 37,5 per person hver vei for 2 gjester (betales kontant lokalt). 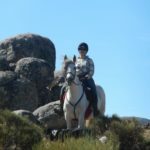 Sierra de Gredos området ligger ca 2 timer vest for Madrid. 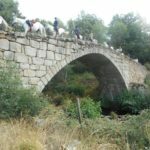 Området er tynt befolket som gjør det til et av de beste stedene for dyreliv i Spania. 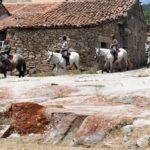 Klimaet i Gredos er kontinentalt med varme og tørre somre og milde vintre. Vi har turer fra juni til november.